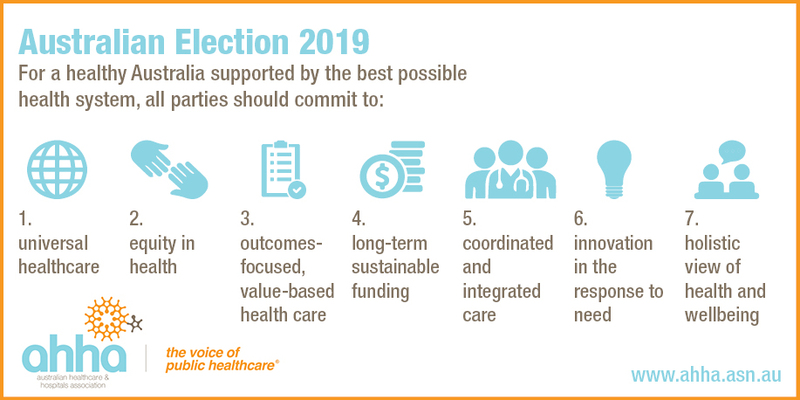 As Australians prepare to elect the 46th Parliament, the Australian Healthcare and Hospitals Association (AHHA) calls on all parties and candidates to commit to working together on much-needed healthcare system reform. ‘The Australian healthcare system is built on a solid foundation, with Medicare and strong public healthcare and hospital sectors providing the basis for universal access to quality healthcare services’, said AHHA Chief Executive Alison Verhoeven. ‘A priority for the incoming 46th Parliament must be to secure effective, accessible, equitable and affordable healthcare focused on quality outcomes. ‘Large, structural reforms are needed to deliver better healthcare access and affordability, rather than the uncoordinated and piecemeal policy initiatives that have occurred in recent years. In particular, addressing out of pocket costs must be prioritised. ‘Australia’s healthcare system consistently outperforms other OECD countries when comparing key health indicators, but an ageing population, increased rates of chronic and complex disease and new medical technologies and treatments are increasing the cost and complexity of healthcare. ‘The Commonwealth Government has a vital role to play in supporting the healthcare sector as it reforms to meet these challenges and the needs of all Australians—particularly those whose needs are currently not well supported such as First Nations peoples, people living in rural and remote Australia, people on low incomes and people with chronic disease and mental illness. ‘AHHA and Australian health leaders have mapped out how to transform our healthcare system into a fit-for-purpose 21st century system. Healthy people, healthy systems (www.ahha.asn.au/Blueprint) is a comprehensive blueprint with a range of short, medium and long term recommendations on how to progressively reorientate our healthcare system to focus on patient outcomes and value rather than throughput and vested interests. a holistic view of health and wellbeing. Australians have consistently placed health at the top of the list as they make their voting decisions. We call on all parties and candidates to commit to a healthy Australia with a strong, fair and affordable health system that meets the needs of all Australians. To follow AHHA commentary throughout the election campaign, visit www.ahha.asn.au/election. You can also follow our #AusVotes2019 #AusVotesHealth commentary on Twitter by following @AusHealthcare.